John Lackland, King of England, the youngest son of King Henry II by Eleanor of Aquitaine, was born at Oxford on the 24th of December 1167. He was given at an early age the nickname of Lackland because, unlike his elder brothers, he received no land rights in the continental provinces. But his future was subject of anxious thought to Henry II. When only five years old John was betrothed (1173) to the heiress of Maurienne and Savoy, a principality which, as dominating the chief routes from France and Burgundy to Italy, enjoyed a consequence out of all proportion to its area. Later, when this plan had fallen through he was endowed with castles, revenues and lands on both sides of the channel; the vacant earldom of Cornwall was reserved for him (1175); he was betrothed to Isabella the heiress of the earldom of Gloucester (1176); and he was granted the lordship of Ireland with the homage of the Anglo-Irish baronage (1177). Henry II even provoked a civil war by attempting to transfer he duchy of Aquitaine from the hands of his brother Richard the Lionheart to those of John (1183). In spite of the incapacity which he displayed in this war, John was sent a little later to govern Ireland (1185); but he returned in a few months covered with disgrace, having alienated the loyal chiefs by his childish insolence and entirely failed to defend the settlers from the hostile clans. Remaining henceforth at his father's side he was treated with he utmost indulgence. But he joined with his brother Richard and the French king Philip Augustus in the great conspiracy of 1189, and the discovery of his treason broke the heart of the old king. 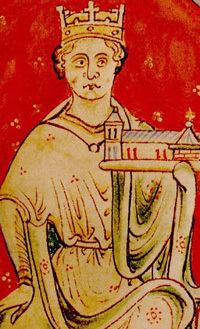 Richard on his accession confirmed John's existing possessions; married him to Isabella of Gloucester; and gave him, besides other grants, the entire revenues of six English shires; but excluded him from any share in the regency which was appointed to govern England during the third crusade; and only allowed him to live in the kingdom because urged to this concession by their mother. Soon after the king's departure for the Holy Land it became known that he had designated his nephew, the young Arthur of Brittany, as his successor. John at once began to intrigue against the regents with the aim of securing England for himself. He picked a quarrel with the unpopular chancellor William Longchamp, and succeeded, by the help of the barons and the Londoners, in expelling this minister, whose chief fault was that of fidelity to the absent Richard. Not being permitted to succeed Longchamp as the head of the administration, John next turned to Philip Augustus for help. A bargain was struck; and when Richard was captured by Leopold, duke of Austria (December 1192), the allies endeavored to prevent his release, and planned a partition of his dominions. They were, however, unable to win either English or Norman support and their schemes collapsed with Richard's return (March 1194). He magnanimously pardoned his brother, and they lived on not unfriendly terms for the next five years. On his deathbed Richard, reversing his former arrangements, caused his barons to swear fealty to John (1199), although the hereditary claim of Arthur was by the law of primogeniture undoubtedly superior. England and Normandy, after some hesitation, recognized John's title; the attempt of Anjou and Brittany to assert the rights of Arthur ended disastrously by the capture of the young prince at Mirebeau in Poitou (1202). But there was no part of his dominions in which John inspired personal devotion. Originally accepted as a political necessity, he soon came to be detested by the people as a tyrant and despised by the nobles for his cowardice and sloth. He inherited great difficulties -- the feud with France, the dissensions of the continental provinces, the growing indifference of England to foreign conquests, the discontent of all his subjects with a strict executive and severe taxation. But he cannot be acquitted of personal responsibility for his misfortunes. Astute in small matters, he had no breadth of view or foresight; his policy was continually warped by his passions or caprices; he flaunted vices of the most sordid kind with a cynical indifference to public opinion, and shocked an age which was far from tenderhearted by his ferocity to vanquished enemies. He treated his most respectable supporters with base ingratitude, reserved his favor for unscrupulous adventurers, and gave a free rein to the license of his mercenaries. While possessing considerable gifts of mind and a latent fund of energy, he seldom acted or reflected until the favorable moment had passed. Each of his great humiliations followed as the natural result of crimes or blunders. By his divorce from Isabella of Gloucester he offended the English baronage (1200); by his marriage with Isabella of Angoul�me, the betrothed of Hugh of Lusignan, he gave an opportunity to the discontented Poitevins for invoking French assistance and to Philip Augustus for pronouncing against him a sentence of forfeiture. The murder of Arthur (1203) ruined his cause in Normandy and Anjou; the story that the court of the peers of France condemned him for the murder is a fable, but no legal process was needed to convince men of his guilt. In the later quarrel with Pope Innocent III (1207-13) he prejudiced his case by proposing a worthless favorite for the primacy and by plundering those of the clergy who bowed to the pope's sentences. Threatened with the desertion of his barons he drove all whom he suspected to desperation by his terrible severity towards the Braose family (1210); and by his continued misgovernment irrevocably estranged the lower classes. When submission to Rome had somewhat improved his position he squandered his last resources in a new and unsuccessful war with France (1214), and enraged the feudal classes by new claims for military service and scutages. The barons were consequently able to exact, in Magna Carta (June 1215), much more than the redress of legitimate grievances; and the people allowed the crown to be placed under the control of an oligarchical committee. When once the sovereign power had been thus divided, the natural consequence was civil war and the intervention of the French king, who had long watched for some such opportunity. John's struggle against the barons and Prince Louis (1216), afterwards King Louis VIII, was the most creditable episode of his career. But the calamitous situation of England at the moment of his death, on the 19th of October 1216, was in the main his work; and while he lived a national reaction in favor of the dynasty was out of the question.